European Escapade - First London Buy! It was already noon when we arrived at Gatwick Airport. Earlier, we had booked online tickets to London Victoria Station on the Gatwick Express so after collecting them from the counter; we proceeded to board the train. By that time, I was exhausted and longed for a nice hot shower. I did not bother bringing along my fancy Lush bath & body products on this trip so I was banking on the hotel's health & beauty toiletries to soothe away my travel fatigue. Our journey took about half an hour and I killed time by snapping pictures as our train sped its way to London. From Victoria Station, we had to make our way to Gloucester Station, which was where our hotel was located. Thank goodness for B and his keen sense of direction who confidently took charge of getting us to our hotel. Despite already travelling for 17 hours, I just had to make a quick stop when I spotted my favourite handmade cosmetic store Lush right in the middle of the station! My favourite store in the whole wide world! Inside, I was in ecstasy; eagerly sniffing all the scent-sational bath melts, skin care products and new fragrances on sale. Each sniff left me wanting more and a little upset too; knowing I won't be able to bring them all home with me. In the end I settled for just one Mrs. Whippy Strawberry Bath Ballistic. My plan was to use this new bath ball on my trip and not bring it home. It would be too heavy to load them inside my suitcase. Besides, I still had 6 days in London to shop some more so I limited my very first buy to just ONE delicious Mrs. Whippy. By the way, it is my dream to own a Lush store one fine day! 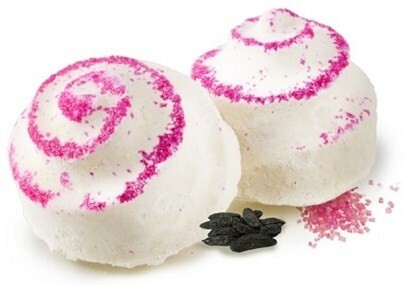 When popped inside running water, Mrs. Whippy Strawberry Bath Ballistic fizzes into a milk bath. With a soya milk middle to ensure a softer smoother soak, this new item also smells awesome and I totally enjoyed my strawberry ice cream bath! We arrived at Best Western, The Cromwell by late afternoon and if you're wondering how it looks like on the inside, keep on reading my blog for more vacation stories! Until then, thanks for following my European Escapade and I hope you're having a good journey so far. i wanna try that bath too! eh how come your hair here looks darker eh? nice also lah.. but just wondering.. ahahha.. so kaypoh.. lol!! you looked pretty exhausted but still look good despite 17 hours of traveling. i love LUSH. i stumbled upon this store when in Vienna but unfortunately it was closed. my heart dropped but at least i managed to take a few shots from the shop windows. enjoy your ice-cream bath sweetie. weee! You deserve a vacation, Marzie! I am so happy to know that you are having great days in Europe. Have an awesome week! Hugs! Hi, I got your message. It's fine you miss the review contest. You can send your review at anytime. But there still a chance if you would like to participate in photo contest. It's till Sept 29 here o you still have more than 24 hours to post your picture. It's easy, just take a picture of you with my book, write the date, location and the person who took that picture and give your short comment. That's it!! Oh Wow! Such beautiful photos, Sweetie. Didn't know you were off for an escapade, too. Hehe! 17 hours is such a long, long trip. Arrrrggh! Must be a pain in the bu**, hehe. Was here again! Hope all is well. Hugs! My wife is crazy about Lush products as well and we have a well stocked supply of bath bombs and the part is that I get to use them as well. Wow, finally your London escape! !